When you hear the term “All-American family” what images immediately come to mind? Are you picturing a scene from an 80s sitcom?” Or perhaps a tidy little house surrounded by a white-picket fence? Like apple pie amidst the backdrop of the stars and stripes, these images of the American ideal are embedded in our society, but yet so many families do not fit the mold. To give readers a new perspective of the meaning of family, author and UT Austin alumna Paige Schilt (MA ’96, PhD ’00) chronicles her own story in her new book “Queer Rock Love: A Family Memoir” (Transgress Press, 2015). Through the power of raw, heartfelt storytelling, she shares the trials and triumphs of raising a gender-nonconforming family in the red state of Texas. We sat down with Schilt to learn more about some big takeaways from her book—and why it’s important to face adversity head-on and embrace the many obstacles life throws our way. What inspired you to write your memoir — in other words, why did you have to share your story? I started writing stories about my tattooed, feminist, gender-nonconforming family—how we navigated day-to-day life in Texas, how we talked to our kid about gender—on an LGBTQ blog called The Bilerico Project. To my surprise, the stories were popular with a broad spectrum of readers, not just queer folks. In fact, some of my most loyal readers were the straight parents of my son’s friends from preschool. I was working for an LGBTQ social justice organization and becoming increasingly concerned about the politics of family respectability in the movement for equality. I was worried that stories about perfect gay poster families might be effective in the short term, but in the long term, they might be a source of shame for nontraditional families who didn’t see themselves reflected in the model of the shiny-happy, heteronormative nuclear family that just happens to have two moms or two dads. So I tried to write really honestly about all the messiness of my family life, and it turned out that readers really responded to that. The book covers some deeply personal moments in your life. What was it like revisiting some of the darkest and brightest chapters? I wrote all the brightest and funniest chapters first, and I waited until I had book contract in hand to write the darkest moments. The middle part of the book is about my wife’s struggle with hepatitis C. Living with chronic illness really distorts your sense of time, and it’s hard to translate that into a compelling narrative. So I procrastinated that part until the end of my writing process, which was probably good because it gave me time to grow as a writer. The synopsis states that “Queer Rock Love shatters the notion that families are always heteronormative.” Could you elaborate a little more about this? For me, queer family is about honoring relationships that aren’t defined by blood or marriage or a shared domestic space. The title of the book comes from a song called “Dyke Hag,” which was penned by my friend (and fellow UT alum) Rachael Shannon. The song is a celebration of queer creative community and the non-nuclear-family ties that bind. When I was writing the book, the title was like a string around my finger, reminding me to always keep the big picture of queer community in mind, even as I was writing about marriage and parenting. What is the most frequent question you’re asked when people read your story? A lot of people ask if I’m going to make it into an audiobook. What message do you hope readers will take away from the book? Be open about your failures and messes. Ask for help when you need it. It will help you connect with other humans. Do you have another book in the works? I’m writing an as “as told to” memoir with someone else. It’s all the fun of constructing a compelling narrative, without the angst of dredging up my own secrets. 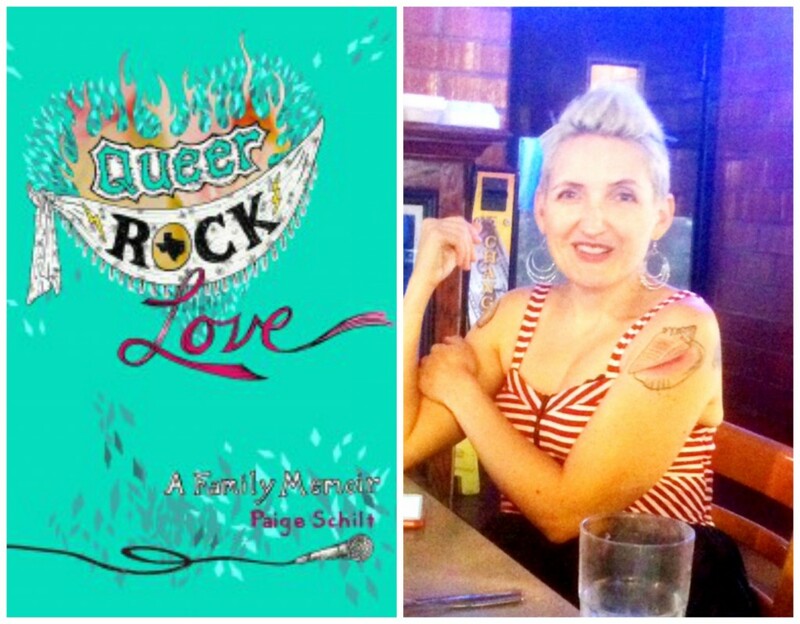 This entry was posted in Alumni Books, Author Interviews and tagged Paige Schilt, queer rock love, Queer Rock Love: A Family Memoir by Jessica Sinn. Bookmark the permalink.